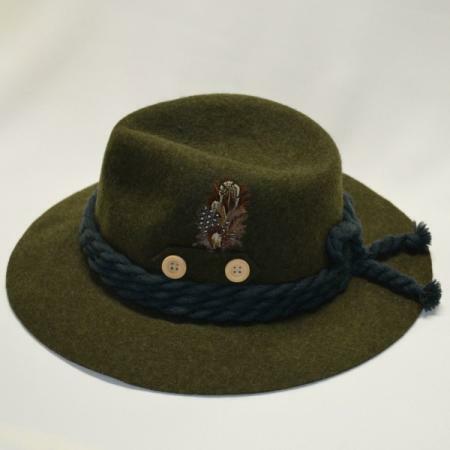 This German imported hat is made from 100% wool and features a feather, feather holder with buttons, and roping with bow tied on back. Made in Germany. Shield pin with castle and “Neuschwanstein” across the top. Imported. Measures 1/2″ by 3/4″. Painted Bayern shield and pick hat pin. Imported. Measures 2 1/8″by 7/8″. Printed Enzian flower pin. Imported. Measures 2″ by 3/4″. Painted cable car and floral hat pin. Imported. Measures 1 1/8″ by 1 1/2″.